Odum Library has been acquiring e-books from a variety of academic publishers for over ten years. 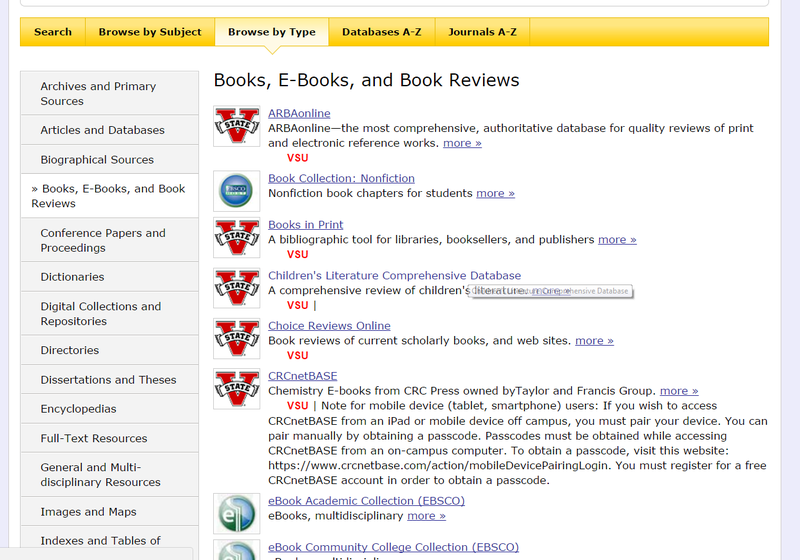 The e-books reside in several vendor databases. Since each e-book vendor is different, please visit the specific e-book database guide as listed in the menu for more specific information regarding viewing, printing, copying, and downloading instructions. If you want to find an e-book at Valdosta State University's Odum Library, there are several places you can search. 1. Visit Odum Library's catalog, GIL-Find. From here, you can do a basic search. Alternatively, you can click on Advanced Search for more search options and fields. 2. Search the catalog using keywords. You can search by title, subject, author, etc. Select the format: Books. 3. In the search results, click on Full Access Online. This option can be found above the search results or in the column to the left of the search results. 1. 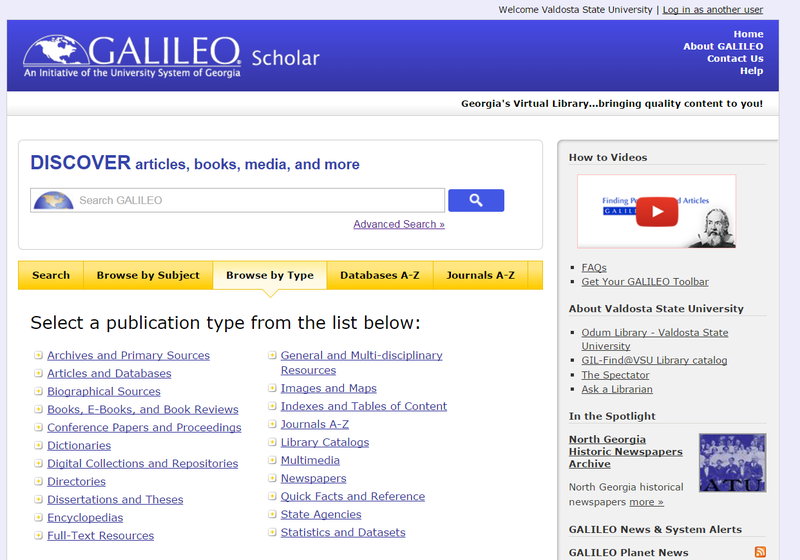 Search in Discover GALILEO by author, title, subject, etc. 2. 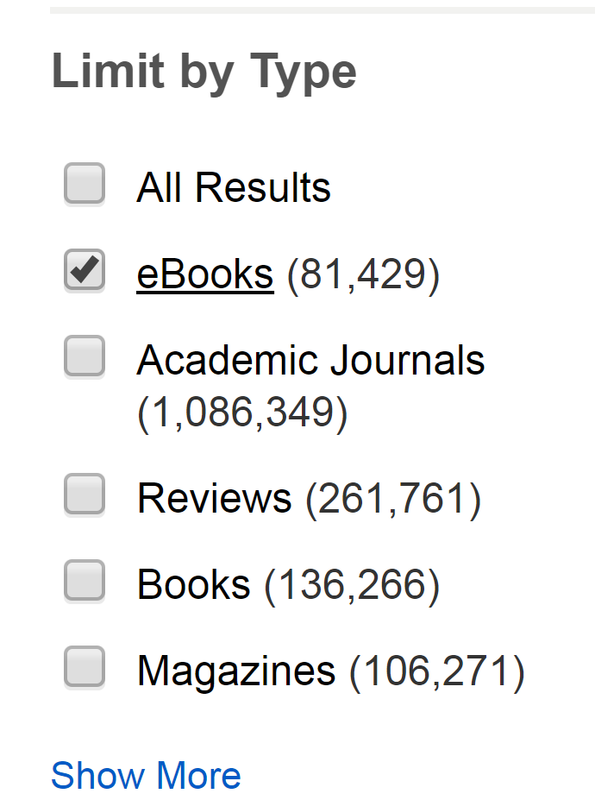 In the search results, select eBooks from the left side under Limit By Type. 1. 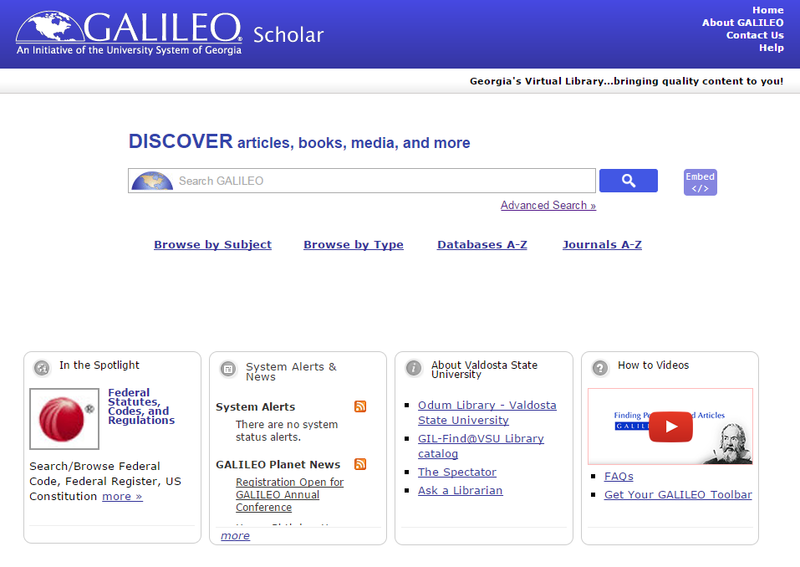 On the Discover GALILEO home page, click on Browse By Type. 3. Select an eBook database that interests you and search within it for eBooks. E-books and the e-book databases are accessible on & off campus. Off-campus access requires login using your VSU Email username/password or the GALILEO password. If you have difficulty logging-in, please use the "Live Chat" button to request assistance. The database vendor may require the creation of a free account to download e-books or perform other tasks, i.e. saving to a favorites folders or adding notes. If you create one of these accounts, please use your institutional email address (@valdosta.edu). Looking for General Fiction or Non-Fiction? Many public libraries including the South Georgia Regional Library (SGRL) offer popular fiction and non-fiction e-books and audiobooks through RBdigital. For information about getting an SGRL library card and securing the necessary PINES password visit South Georgia Regional Library or check with the public library in your home community. Can read e-books online in a web browser. Some e-books are restricted to one reader at a time. You will receive a message if a book has reached its limit of users. Many e-books compatible for download for mobile devices and e-readers. Additional apps like Adobe Digital Editions or Bluefire Reader may be required. Academic e-book content is usually limited to printing/copying a specific number of pages or chapters.